On July 21, 2004, President Bush signed the Project Bioshield Act, which authorizes the spending of $5.6 billion to advance the development and acquisition of vaccines and other countermeasures to biological agents. While the funding and progress are welcome signs for our national biodefense strategy, the failure of the federal Phase I smallpox vaccination program demonstrated that other serious obstacles remain to the implementation of a successful pre-event vaccine immunization program. Specifically, as demonstrated by a field study of several states' health departments, performed at the ANSER Institute for Homeland Security, the federal government's inability to provide both sufficient liability protection and adequate compensation to first responders seriously jeopardizes the success of pre-event vaccination programs. Although the cost of providing both liability protection and adequate compensation at the pre-event stage may seem large, it pales in comparison to what the cost would be should a smallpox outbreak occur without the benefit of vaccinated first responders. 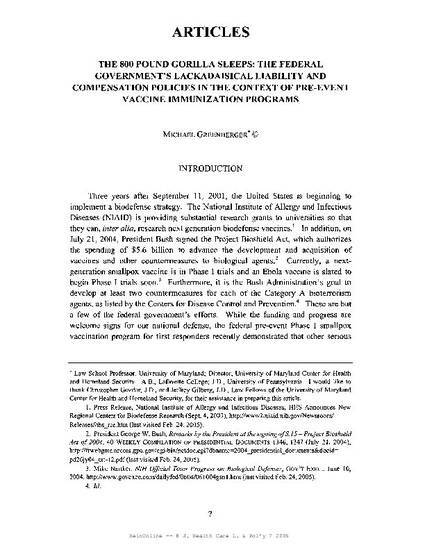 This Article analyzes past and current vaccine liability and injury compensation schemes as a basis for suggesting changes that the federal government must put in place for future pre-event vaccination programs to be successful. 8 Journal of Health Care Law & Policy 7 (2005).